1 Accident Allowance Not included in the report. 3 Aeronautical Allowance Retained. Enhanced by 50%. 4 Air Despatch Pay Abolished. 5 Air Steward Allowance Abolished. 6 Air Worthiness Certificate Allowance Retained. Enhanced by 50%. Not included in the report. 8 Allowance in Lieu of Running Room Facilities Not included in the report. 9 Annual Allowance Retained. Enhanced by 50%. Extended to some more categories. 10 Antarctica Allowance Retained. Rationalised. To be paid as per Cell RH-Max of the newly proposed Risk and Hardship Matrix. 11 Assisting Cashier Allowance Abolished. 13 Bad Climate Allowance Abolished as a separate allowance. Subsumed in Tough Location Allowance-III. To be paid as per Cell R3H3 of the newly proposed Risk and Hardship Matrix. 14 Bhutan Compensatory Allowance Retained. Status Quo to be maintained. 15 Boiler Watch Keeping Allowance Retained. Rationalised. To be paid as per Cell R3H1 of the newly proposed Risk and Hardship Matrix. 16 Book Allowance Retained. Status Quo to be maintained. 17 Breach of Rest Allowance Not included in the report. 19 Briefcase Allowance Retained. Status Quo to be maintained. 20 Camp Allowance Abolished as a separate allowance. Subsumed in the newly proposed Territorial Army Allowance. 21 Canteen Allowance Retained. Enhanced by 50%. 23 Cash Handling Allowance Abolished. 24 Children Education Allowance (CEA) Retained. Procedure of payment simplified. 25 CI Ops Allowance Retained. Rationalized. 26 Classification Allowance Retained. Enhanced by 50%. 27 Clothing Allowance Abolished as a separate allowance. Subsumed in the newly proposed Dress Allowance. 29 COBRA Allowance Retained. Rationalised. To be paid as per Cell R1H1 of the newly proposed Risk and Hardship Matrix. 33 Compensation in Lieu of Quarters (CILQ) Abolished as a separate allowance. Eligible employees to be governed by the newly proposed provisions for Housing for PBORs. 34 Compensatory (Construction or Survey) Allowance Retained. Rationalised. To be paid as per Cell R3H2 of the newly proposed Risk and Hardship Matrix. 35 Composite Personal Maintenance Allowance (CPMA) Retained. Rationalised. Enhanced by 50%. Extended to some more categories. 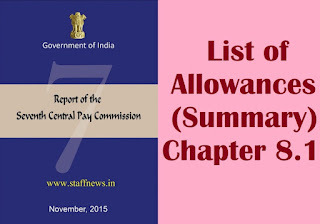 37 Constant Attendance Allowance Retained. Enhanced by 50%. 38 Conveyance Allowance Retained. Status Quo to be maintained. 39 Cooking Allowance Retained. Rationalised. To be paid as per Cell R3H3 of the newly proposed Risk and Hardship Matrix. 40 Cost of Living Allowance Retained. Status Quo to be maintained. 43 Daily Allowance Retained. Rationalized. 44 Daily Allowance on Foreign Travel Retained. Status Quo to be maintained. 45 Dearness Allowance (DA) Retained. Status Quo to be maintained. 46 Deputation (Duty) Allowance for Civilians Retained. Ceilings enhanced by 50%. 47 Deputation (Duty) Allowance for Defence Personnel Retained. Ceilings enhanced by 50%. 49 Detachment Allowance Retained. Rationalized. Enhanced by 50%. 51 Diving Allowance, Dip Money and Attendant Allowance Retained. Enhanced by 50%. 52 Dual Charge Allowance Abolished as a separate allowance. Eligible employees to be governed by the newly proposed “Additional Post Allowance”. 53 Educational Concession Retained. Rationalized. Extended to some more categories. 55 Entertainment Allowance for Cabinet Secretary Abolished. 56 Entertainment Allowance in Indian Railways Abolished. 57 Extra Duty Allowance Abolished as a separate allowance. Eligible employees to be governed by the newly proposed “Extra Work Allowance”. 58 Family Accommodation Allowance (FAA) Abolished as a separate allowance. Eligible employees to be governed by the newly proposed provisions for Housing for PBORs. 59 Family HRA Allowance Retained. Status Quo to be maintained. 60 Family Planning Allowance Abolished. 61 Field Area Allowance Retained. Rationalized. 62 Fixed Medical Allowance (FMA) Retained. Status Quo to be maintained. 63 Fixed Monetary Compensation Abolished as a separate allowance. Eligible employees to be governed by the newly proposed “Additional Post Allowance”. 64 Flag Station Allowance Abolished as a separate allowance. Eligible employees to be governed by the newly proposed “Extra Work Allowance”. 65 Flight Charge Certificate Allowance Abolished as a separate allowance. Eligible employees to be governed by the newly proposed “Extra Work Allowance”. 66 Flying Allowance Retained. Rationalised. To be paid as per Cell R1H1 of the newly proposed Risk and Hardship Matrix. 67 Flying Squad Allowance Abolished. 68 Free Fall Jump Instructor Allowance Retained. Rationalised. To be paid as per Cell R2H2 of the newly proposed Risk and Hardship Matrix. 70 Ghat Allowance Not included in the report. Retained. Enhanced by a factor of 2.25. 72 Haircutting Allowance Abolished as a separate allowance. Subsumed in Composite Personal Maintenance Allowance. 74 Hard Area Allowance Retained. Rationalized by a factor of 0.8. 75 Hardlying Money Retained. Rationalised. Full Rate to be paid as per Cell R3H3 of the newly proposed Risk and Hardship Matrix. 77 Health and Malaria Allowance Retained. Rationalised. To be paid as per Cell R3H3 of the newly proposed Risk and Hardship Matrix. 78 High Altitude Allowance Retained. Rationalized. 79 Higher Proficiency Allowance Abolished as a separate allowance. Eligible employees to be governed by Language Award or Higher Qualification Incentive for Civilians. 80 Higher Qualification Incentive for Civilians Retained. Rationalized. 81 Holiday Compensatory Allowance Abolished as a separate allowance. Eligible employees to be governed by National Holiday Allowance. 82 Holiday Monetary Compensation Retained. Rationalized. 83 Hospital Patient Care Allowance/Patient Care Allowance Retained. Rationalised. To be paid as per Cell R1H3 of the newly proposed Risk and Hardship Matrix. 84 House Rent Allowance (HRA) Retained. Rationalized by a factor of 0.8. 86 Hydrographic Survey Allowance Retained. Rationalized. 87 Initial Equipment Allowance Abolished as a separate allowance. Subsumed in the newly proposed Dress Allowance. 88 Instructional Allowance Abolished as a separate allowance. Eligible employees to be governed by Training Allowance. 89 Internet Allowance Retained. Rationalized. 91 Island Special Duty Allowance Retained. Rationalized by a factor of 0.8. 92 Judge Advocate General Department Examination Award Abolished as a separate allowance. Eligible employees to be governed by the newly proposed Higher Qualification Incentive for Defence Personnel. 93 Kilometreage Allowance (KMA) Not included in the report. 94 Kit Maintenance Allowance Abolished as a separate allowance. Subsumed in the newly proposed Dress Allowance. 95 Language Allowance Retained. Enhanced by 50%. 96 Language Award Retained. Enhanced by 50%. 97 Language Reward and Allowance Abolished. 98 Launch Campaign Allowance Abolished. 99 Leave Travel Concession (LTC) Retained. Rationalized. 100 Library Allowance Abolished as a separate allowance. Eligible employees to be governed by the newly proposed “Extra Work Allowance”. 101 MARCOS and Chariot Allowance Retained. Rationalised. To be paid as per Cell R1H1 of the newly proposed Risk and Hardship Matrix. 103 Messing Allowance Retained for “floating staff” under Fishery Survey of India, and enhanced by 50%. Abolished for Nursing Staff. 105 Mileage Allowance for journeys by road Retained. 106 Mobile Phone Allowance Retained. Rationalized. 107 Monetary Allowance attached to Gallantry Awards Retained. Status Quo to be maintained. 108 National Holiday Allowance Retained. Enhanced by 50%. 109 Newspaper Allowance Retained. Rationalized. 110 Night Duty Allowance Retained. Rationalized. 111 Night Patrolling Allowance Abolished. 112 Non-Practicing Allowance (NPA) Retained. Rationalized by a factor of 0.8. 113 Nuclear Research Plant Support Allowance Retained. Enhanced by 50%. 114 Nursing Allowance Retained. Rationalized. 115 Official Hospitality Grant in Defence forces Abolished. 116 Officiating Allowance Not included in the report. 117 Operation Theatre Allowance Abolished. 118 Orderly Allowance Retained. Status Quo to be maintained. 119 Organization Special Pay Abolished. Abolished as a separate allowance. Eligible employees to be governed by Daily Allowance on Foreign Travel. 121 Outfit Allowance Abolished as a separate allowance. Subsumed in the newly proposed Dress Allowance. 122 Outstation (Detention) Allowance Not included in the report. 123 Outstation (Relieving) Allowance Not included in the report. 125 Overtime Allowance (OTA) Abolished. 126 Para Allowances Retained. Rationalised. To be paid as per Cell R2H2 of the newly proposed Risk and Hardship Matrix. 127 Para Jump Instructor Allowance Retained. Rationalised. To be paid as per Cell R2H2 of the newly proposed Risk and Hardship Matrix. 128 Parliament Assistant Allowance Retained. Enhanced by 50%. 129 PCO Allowance Retained. Rationalized. 130 Post Graduate Allowance Retained. Enhanced by 50%. 131 Professional Update Allowance Retained. Enhanced by 50%. Extended to some more categories. 132 Project Allowance Retained. Rationalised. To be paid as per Cell R3H2 of the newly proposed Risk and Hardship Matrix. 133 Qualification Allowance Retained. Enhanced by 50%. Extended to some more categories. 134 Qualification Grant Abolished as a separate allowance. Eligible employees to be governed by the newly proposed Higher Qualification Incentive for Defence Personnel. 135 Qualification Pay Retained. Enhanced by a factor of 2.25. 138 Ration Money Allowance Retained. Rationalized. 139 Refreshment Allowance Retained. Enhanced by a factor of 2.25. 140 Rent Free Accommodation Abolished. 141 Reward for Meritorious Service Retained. Enhanced by a factor of 2.25. 143 Robe Allowance Abolished as a separate allowance. Subsumed in the newly proposed Dress Allowance. 144 Robe Maintenance Allowance Abolished as a separate allowance. Subsumed in the newly proposed Dress Allowance. 145 Savings Bank Allowance Abolished. 146 Sea Going Allowance Retained. Rationalised. To be paid as per Cell R2H2 of the newly proposed Risk and Hardship Matrix. 148 Shoe Allowance Abolished as a separate allowance. Subsumed in the newly proposed Dress Allowance. 150 Shunting Allowance Not included in the report. 151 Siachen Allowance Retained. Rationalised. To be paid as per Cell RH-Max of the newly proposed Risk and Hardship Matrix. 152 Single in Lieu of Quarters (SNLQ) Abolished as a separate allowance. Eligible employees to be governed by the newly proposed provisions for Housing for PBORs. 153 Soap Toilet Allowance Abolished as a separate allowance. Subsumed in Composite Personal Maintenance Allowance. 154 Space Technology Allowance Abolished. 155 Special Allowance for Child Care for Women with Disabilities Retained. Enhanced by 100%. 156 Special Allowance to Chief Safety Officers/Safety Officers Retained. Rationalized by a factor of 0.8. 157 Special Appointment Allowance Abolished as a separate allowance. Eligible employees to be governed by the newly proposed “Extra Work Allowance”. 158 Special Compensatory (Hill Area) Allowance Abolished. 159 Special Compensatory (Remote Locality) Allowance Abolished as a separate allowance. Eligible employees to be governed by the newly proposed Tough Location Allowance-I, II or III. 160 Special DOT Pay Abolished. 161 Special Duty Allowance Retained. Rationalized by a factor of 0.8. 162 Special Forces Allowance Retained. Rationalised. To be paid as per Cell R1H1 of the newly proposed Risk and Hardship Matrix. 163 Special Incident/Investigation/ Security Allowance Retained. Rationalized. 164 Special LC Gate Allowance Retained. Rationalised. To be paid as per Cell R3H3 of the newly proposed Risk and Hardship Matrix. 165 Special NCRB Pay Abolished. 166 Special Running Staff Allowance Retained. Extended to some more categories. 167 Special Scientists’ Pay Abolished. 168 Specialist Allowance Retained. Enhanced by 50%. 170 Split Duty Allowance Retained. Enhanced by 50%. 172 Submarine Allowance Retained. Rationalised. To be paid as per Cell R1H1 of the newly proposed Risk and Hardship Matrix. 173 Submarine Duty Allowance Retained. Rationalised. To be paid as per Cell R3H1 of the newly proposed Risk and Hardship Matrix, on a pro-rata basis. 174 Submarine Technical Allowance Retained. Rationalised. To be paid as per Cell R3H3 of the newly proposed Risk and Hardship Matrix. Extended to some more categories. 175 Subsistence Allowance Retained. Status Quo to be maintained. 176 Sumptuary Allowance in Training Establishments Abolished. 177 Sumptuary Allowance to Judicial Officers in Supreme Court Registry Abolished. 178 Sunderban Allowance Abolished as a separate allowance. Subsumed in Tough Location Allowance-III. To be paid as per Cell R3H3 of the newly proposed Risk and Hardship Matrix. 179 TA Bounty Abolished as a separate allowance. Subsumed in the newly proposed Territorial Army Allowance. 180 TA for Retiring Employees Retained. Rationalized. 181 TA on Transfer Retained. Rationalized. 182 Technical Allowance Abolished as a separate allowance. Eligible employees to be governed by the newly proposed Higher Qualification Incentive for Defence Personnel. 183 Tenure Allowance Retained. Ceilings enhanced by 50%. 184 Test Pilot and Flight Test Engineer Allowance Retained. Rationalised. To be paid as per Cell R1H3 of the newly proposed Risk and Hardship Matrix. 185 Training Allowance Retained. Rationalized by a factor of 0.8. Extended to some more categories. 187 Transport Allowance (TPTA) Retained. Rationalized. 188 Travelling Allowance Retained. Rationalized. 190 Tribal Area Allowance Abolished as a separate allowance. Subsumed in Tough Location Allowance-III. To be paid as per Cell R3H3 of the newly proposed Risk and Hardship Matrix. 191 Trip Allowance Not included in the report. 192 Uniform Allowance Abolished as a separate allowance. Subsumed in the newly proposed Dress Allowance. 193 Unit Certificate and Charge Certificate Allowance Retained. Enhanced by 50%. 195 Waiting Duty Allowance Not included in the report. 196 Washing Allowance Abolished as a separate allowance. Subsumed in the newly proposed Dress Allowance. 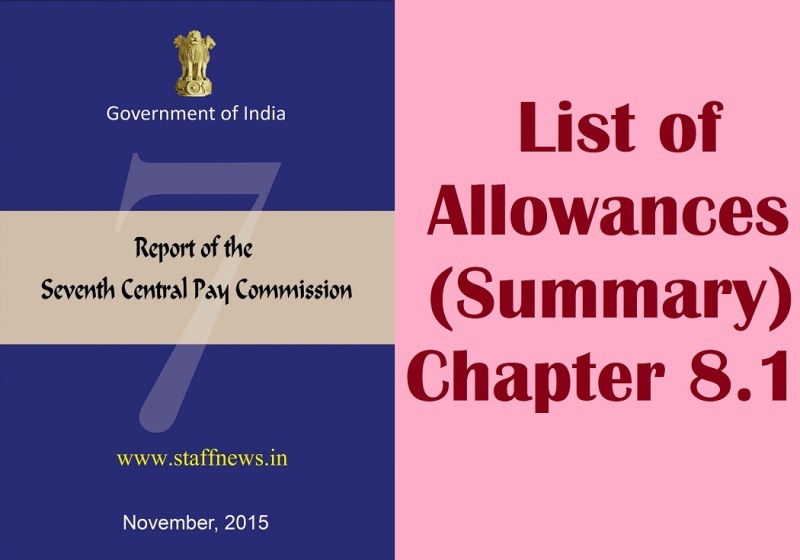 Caretaker allowance continue alongwith washing allowances inc7cpc because staff maintain civil & electrical works. Excellent coverage ; please keep it up , all the best , God bless , regards , rkr.